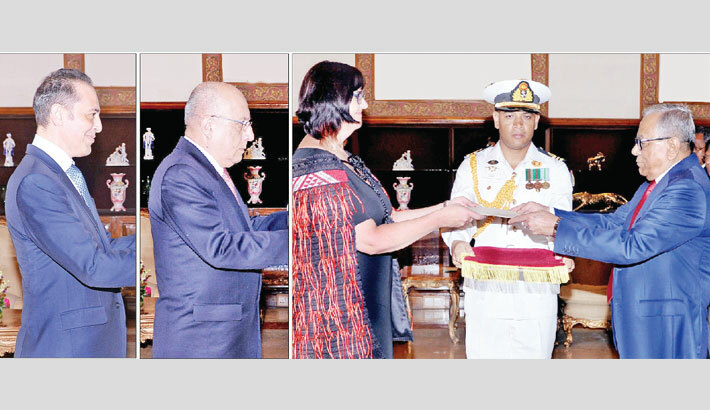 President M Abdul Hamid sought enhanced trade ties with New Zealand, Malta and Peru, as newly appointed envoys of the three countries presented their credentials to him at Bangabhaban in the city on Wednesday, reports BSS. He also urged the countries to recruit skilled manpower from Bangladesh. According to a Bangabhaban spokesman, non-resident High Commissioners Joanna Kempkers and Stephen Borg of New Zealand and Malta respectively, and non-resident Ambassador of Peru Jorge Juan Castaneda Mendez presented their credentials in three subsequent ceremonies after they were ceremonially welcomed to the presidential palace in the afternoon. Receiving their credentials, the President appreciated Bangladesh ties with the three countries and urged them to play an important role in enhancing trade and economic ties for mutual benefits, President’s press secretary Mohammad Joynal Abedin told newsmen.